Emerita Augusta was the resettling space for soldiers discharged from the Cantabrian Roman wars in 25 BC. Augustus Caesar himself ordered for the creation of the colony which now lies in ruins after the fall of Rome in a city called Mérida, Spain. In 1979, Rafael Moneo was a professor of Composition at the School of Architecture of Barcelona. He was commissioned with the project to develop the National Museum of Roman Art. The premier requirement of the new museum was to preserve the ruins of Emerita Augusta while connecting the museum to the theatre and amphitheatre. The archaeological findings revealed a great national treasure. The whole site on which lies the ruins was an important historical and cultural component of what Rome used to be. In fact, the Roman Theatre of Mérida – one of the most magnificent surviving Roman theatres – was therein. Moneo’s museum would replace an existing 1838 museum on the same site. The museum occupies the site across the street from the theatre, and is articulated in sequences of arches made from Roman brick. A central space on upper stories is accompanied by exhibition spaces on the sides. Integrated skylights above thin brick arches fill the spaces with natural light that combines with the brick material to provide a warm natural glow. Below the ground, a buried space that feels like a cellar enters the visitors into the Roman-era archaeological part of the city. This integration enables the museum to conserve the old archaeological site while simultaneously catering for a new space. The arches are inspired by the brick arches in the old Roman Theatre – an important inspiration for the new museum. The use of materials marks the most important part of the project. One material has been crafted to fit the needs of both context and space. Thin, long brickwork that is almost perfect in terms of uniformity and perfection lines the major spaces. Walls, columns, and arches are all made from brick but look the least definition of monotonous as a composition. The dramatic overhead lighting concludes the expedition to create a museum devoid of mediocre and full of life in a masterful work of art. 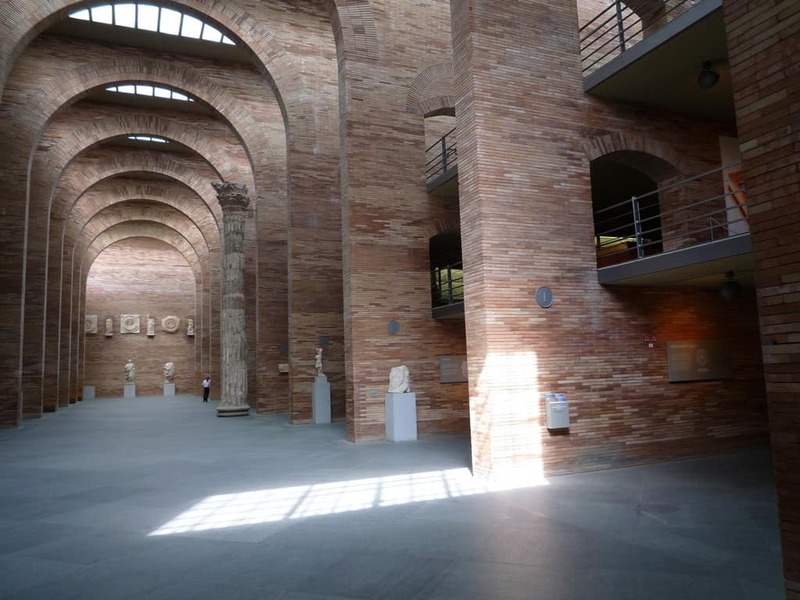 Like most of Moneo’s buildings, the National Museum of Roman Art barely resembles anything he has done before. Yet, his signature orthogonal design with a focus on materials seems to effortlessly come out. The variations in how much brick is enough to do what with is very stylistic. A purposeful articulation of arches and light, texture, form, and material cap what is the one of the most sincere projects in Spanish history, put together by a legendary architect who the country celebrates with great might since the museum launched in great fanfare in 1986.